During the 2018 Big Game, viewers learned that the much-talked about sequel of an ʼ80s movie, "Dundee: The Son of a Legend Returns Home," was not a sequel at all. It was actually an elaborate, star-studded advertising campaign aimed at attracting more travelers to visit Australia. Tourism Australia, the government agency responsible for attracting international visitors to Australia, revealed it is behind the major US marketing campaign. Excitement for the new Crocodile Dundee movie had been steadily building over the month of January. Imitating a traditional studio promotional campaign-using PR, social, digital, OOH and the release of four teaser films-anticipation for the new film was widely reported in People, Buzzfeed, Daily Mail, Good Morning America, and the Hollywood Reporter, among others. 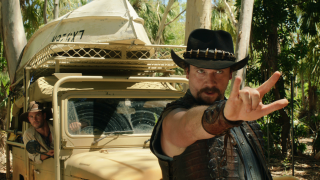 Starring Danny McBride and Chris Hemsworth, with a cameo from Paul "Crocodile Dundee" Hogan himself, the 60-second commercial that aired during the second quarter of the Big Game revealed the joke to viewers. What begins as a typical movie trailer slowly and comically unravels, becoming a flagrant excuse to highlight Australia's dazzling locations and fine array of food and wine. Presented as a buddy comedy, the movie features Danny McBride as Brian Dundee, the long-lost son of Mick Dundee and Chris Hemsworth as his sidekick, Wally Jr. The all-Australian supporting cast has an impressive roll call of Hollywood heavyweights and homegrown talent, including Hugh Jackman, Margot Robbie, Russell Crowe, Ruby Rose, Liam Hemsworth, Isla Fisher, Luke Bracey and Jessica Mauboy. The teasers led viewers to believe that Mick "Crocodile" Dundee was lost in the outback, and only the American son no one knew he had would be able to find him. Cue Brian Dundee returning to the Australian outback to find his father. The teaser films and promotional campaign encouraged fans to tune in to see the "official movie trailer" during the Big Game, where the Tourism Australia campaign was ultimately revealed.